How do you vaccinate people against climate change misinformation? Tell them lies, according to psychologists from the University of Cambridge, Yale University and George Mason University. This idea comes from medicine and virology where exposing the body to a weakened version of the virus allows it to build a tolerance. The point is to tell lies and expose them as lies, not to tell lies as if they were truth. sourceSocial psychologists researching “fakenews” have come up with a strategy published in the journal Global Challenges. 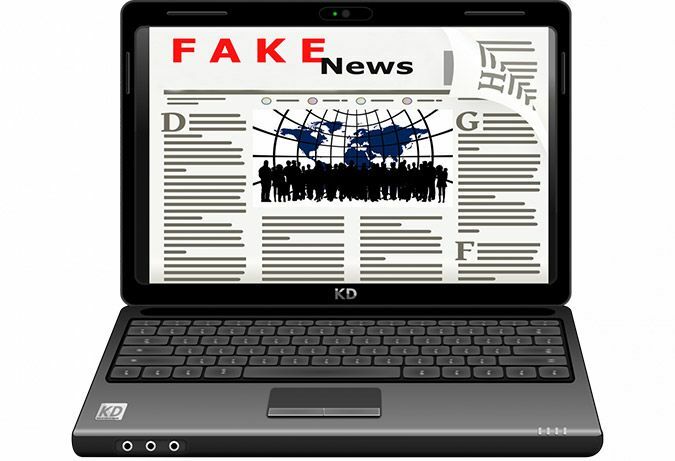 They want to inoculate the public against misinformation, specifically the “fake news” websites such as those they deem to be propagating myths about climate change. Previous research has shown that counteracting politicization of science can be done through high-level consensus forming among experts to convey the reality, yet other research indicates that public opinion on climate change to be shaped with limited external validity. The current research wants to explore how people doing the evaluating process the consensus information while they are in a polarized information environment (like one political party vs. another). In order to get people to address climate change, people will need to change their behaviors and how they make decisions in life. Researchers and scientists see a problem through the increased politicization of climate science and the attempts by certain disinformation campaigns to undermine the “scientific consensus”. Researchers wanted to identify an effective way to engage the public about issues across the political spectrum. In presenting facts followed by misinformation, the false material cancels out the previous accurate statement in people’s minds and end up back where they started. Lies canceled out the facts. Researchers decided to add some misinformation to the delivery of their own facts through distortion tactics used by other groups. For some reason, this helps shift and hold people’s opinion closer to the truth when follow-up exposure to “fake news” was introduced. Once falsity takes root in our consciousness, we can become attached to it and it becomes a mind virus that we unknowingly spread to other consciousnesses through the words we use to influence them into accepting the mind virus. By injecting a small amount of misinformation, this acts as a vaccine that preemptively exposes people and warns them, although subconsciously, about the misinformation and helps them to preserve the facts. The idea is that a cognitive repertoire is built up that acts as a resistance to misinformation and reduces susceptibility to accepting it the next time it is encountered. To determine how opinion shifted, 2000 participants from various ages and political views were shown a website that alleged 31,000 scientists had signed a petition saying there was no evidence of human caused carbon dioxide release leading to global climate change. There was also the alternative accurate statement that 97% of U.S. scientists agree on man-made climate change. Participants there were only shown the climate change consensus showed an increased agreement with the scientific consensus by about 20%. Those were shown misinformation alone resulted in a 9% drop in accepting the scientific consensus. Other participants were shown the accurate information followed by the false petition and there was neither an increase or a drop in accepting the scientific consensus. Conflicting messages can leave people unsure of what is what and it brings them back to square-one where they started off not knowing what was what. 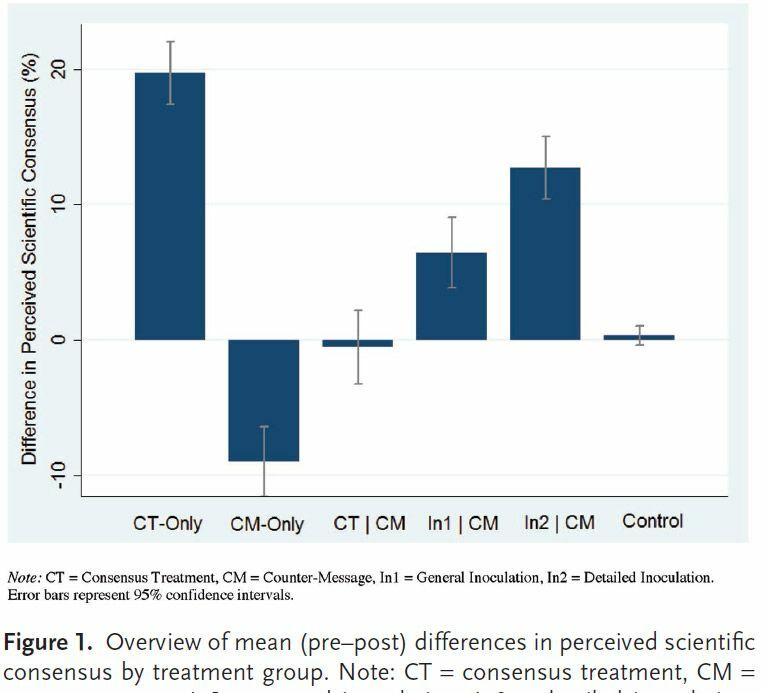 sourceTwo groups were given the information “vaccine” of a general-correction of the false data, which showed a 6.5% increase in acceptance towards the scientific consensus, despite exposure to fake news. A more detailed correction served as an inoculation to achieve a 13% increase in acceptance. The misinformation was not presented as information, but was demonstrated to be false through either general or more specifically detailed corrections, which sowed seeds of doubt and undermined the claims. Tobacco, fossil fuels and chemical companies have long used psychological inoculation to undermine scientific facts in the public consciousness. The same process can be reversed to promote facts instead. 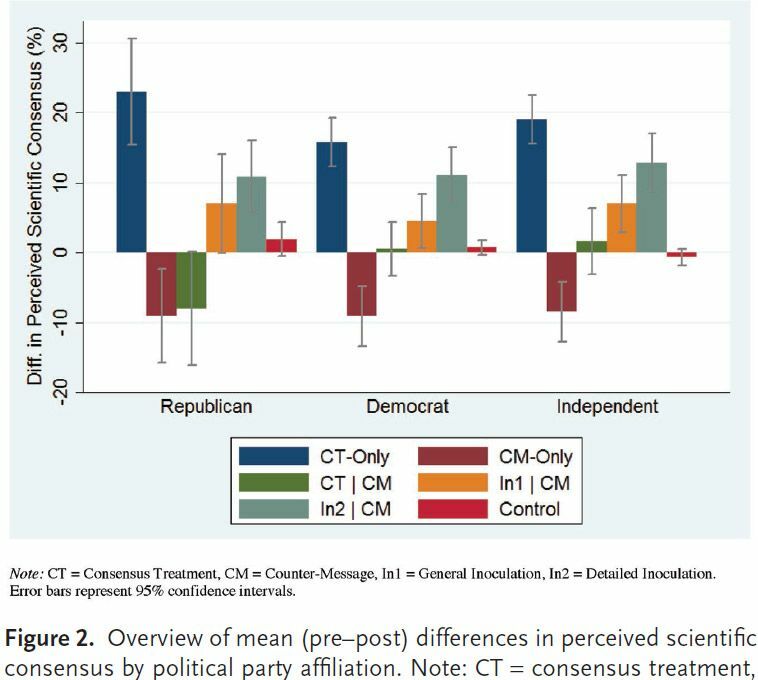 In looking at Republicans, Independents and Democrats, inoculation messages were all equally effective in shifting their opinions to be consistent with climate science conclusions. The normal backfire effect where people reject information did not occur when inoculation messages were used. Including the misinformation in the presentation of facts helps to preemptively warn people against the spread of misinformation that can influence them into accepting falsity. sourceChanging minds is indeed hard, as I recently posted.